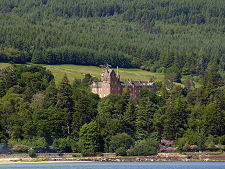 Brodick Castle stands on a south-east facing slope above the north side of Brodick Bay and under the shadow of Goatfell, which rises behind it. It can best be described as a strategically important castle developed over four centuries between the 1200s and the 1600s, with an 1800s stately home wrapped around it. The location was probably first used as a defensive site by the Vikings until they were driven from Arran, and the rest of the western seaboard of Scotland, following the Battle of Largs in 1263. The original castle on the site was built in the years that followed for the Stewarts of Menteith. As originally constructed, the castle was protected by a steep slope descending on its seaward side, and a water filled ditch on its landward side. The castle itself comprised a tower which became the east end of the later building, with a wall of enclosure to its west containing a series of domestic buildings including a kitchen, stables and a chapel. 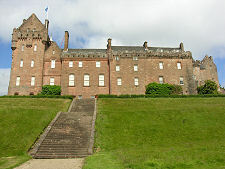 During the Wars of Independence, Brodick Castle was held by the English until retaken by the Scots in 1307. Its subsequent history was equally turbulent. English ships damaged the castle in 1406, and further damage was caused in an attack by John MacDonald II, Lord of the Isles in 1455. Meanwhile, ownership of the castle passed through various hands before it came into the possession of the Hamilton family, later the Marquesses and Dukes of Hamilton, in 1503. 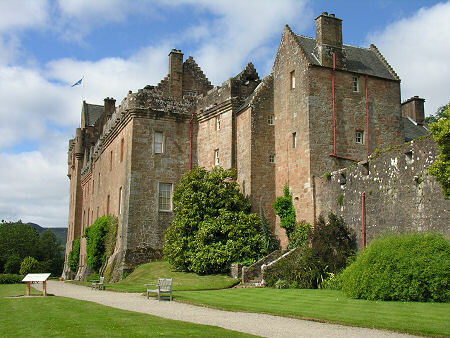 The castle was rebuilt by the Hamiltons in 1510, but suffered further damage in 1528 during clan battles between Campbells and MacLeans, and again in 1544 at the hands of Henry VIII's forces. Further rebuilding and expansion took place in the 1550s, but its troubled history was not yet complete. In 1639 the castle was captured by the Campbells, then recaptured by the Hamiltons. In 1652 Brodick Castle surrendered to the English Parliamentary troops of Oliver Cromwell, and subsequently spent a number of years being used as a barracks by them. During this period the battery you can still see today was built to the east of the main building, and the existing castle was extended by two bays to the west, nearly doubling its size. Today it takes a real act of imagination to see the castle as it must have been during these centuries of conflict, occupation and reoccupation. Only occasional glimpses remain. In 1977, restoration work uncovered a staircase leading to a room that had lain hidden and long forgotten, entirely contained within the thickness of the castle walls. This is now fitted out as the castle dungeon. Other alleged remnants of this earlier history include at least three different ghosts: a man sometimes seen sitting in the library; a white deer only seen, it is said, when the Clan Chief of the Hamiltons is near death; and a grey lady thought to be the ghost of one of three women who died of starvation in the dungeons where they were placed because they were suffering from the plague. What today's visitor finds at Brodick Castle is largely the result of a large scale expansion of the earlier castle undertaken in the years after 1844. 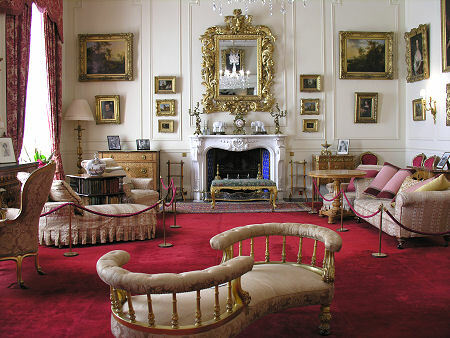 Until this time, the Hamiltons has focused their attentions on their estates on mainland Scotland and especially on Hamilton Palace. But a number of factors came together which made the conversion of Brodick Castle into a grand stately home a viable and desirable option. The first was the advent of the era of much better transport links brought about by the combination of railways and steamer services. Suddenly the Firth of Clyde and its islands became much more easily accessible from the main Scottish centres of population. The second was the marriage in 1843 of the 10th Duke's eldest son, the Marquis of Douglas and Clydesdale, to Princess Marie of Baden, the youngest daughter of the Grand Duke of Baden and a cousin of Napoleon III. And the third was the inheritance in 1844 by Susan Beckford, wife of the 10th Duke of Hamilton, of the wealth and estates of her father, an English landowner. 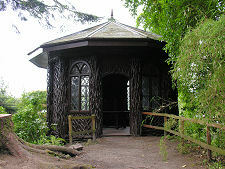 In 1844 the Hamiltons therefore found themselves in need of a home prestigious enough for their oldest son and his new wife; they had access to the funds necessary to undertake a major building project; and Brodick Castle, until then a far flung and inaccessible island outpost, suddenly began to seem much closer. The Hamiltons commissioned the Edinburgh architect James Gillespie Graham to nearly double the size of the main block of the existing castle by extending it south westwards. They then concluded their extension with the massive south west tower that is such a characteristic feature of today's Brodick Castle. 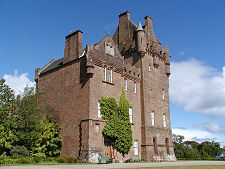 In 1895, Brodick Castle passed to the only child of the 12th Duke of Hamilton, Lady Mary Louise Hamilton. In 1906 she married the 6th Duke of Montrose, and the castle as you see it today is very much the family home they created and lived in. In her later years Mary, Duchess of Montrose worked to enable the National Trust for Scotland to take over the castle plus its contents, gardens and surrounding park, on her death. 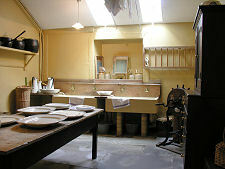 In the event the estate was accepted by the Treasury in lieu of death duties when she died in 1957, and the National Trust for Scotland took over responsibility for running it. 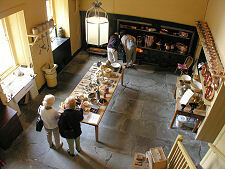 Today's visitors enter the castle through the 1840s front door in the south west tower. 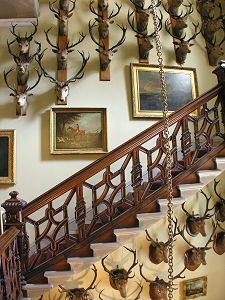 Inside is the magnificent main hall and staircase, complete with a remarkable, if slightly unsettling, collection of 87 mounted stags' heads, 86 of which were shot on Arran. 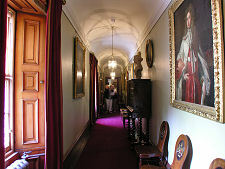 Up on the first floor you are able to pass through two separate, though linked, sets of rooms. 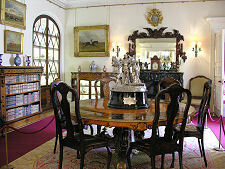 The first is a series of private apartments housed in the south west corner of the castle. 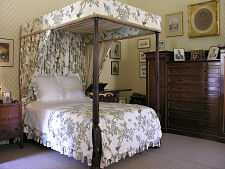 These include a dressing room, a bedroom complete with a magnificent four-poster bed, and a boudoir. 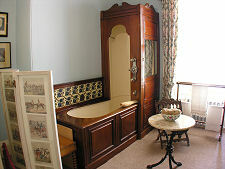 There is also a bathroom complete with a spectacular bath shower. 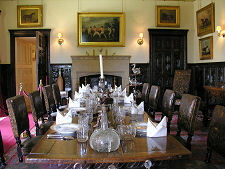 You then enter the Castle's main reception rooms, the drawing room, library and dining room. These extend along the length of the south east face of the castle, passing from the Victorian extension through the Cromwellian addition to the earlier parts of the castle. 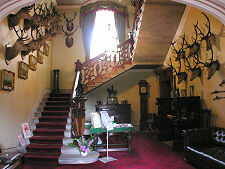 Throughout the castle, but especially in these public rooms, you encounter the enormous collection of artefacts on display, ranging from the paintings to the remarkable collection of sporting trophies assembled by a family with an interest in the sporting life that verged on the fanatical. 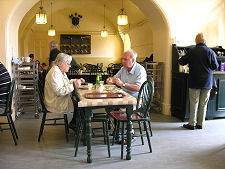 Back on the ground floor you enter the huge kitchen and adjoining scullery, before passing via the service passage to the castle tearoom. 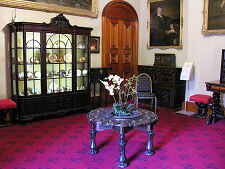 En route you can take minor diversions to view "Bruce's Room", the room discovered within the walls of the castle in 1977, and presumed to be a dungeon; and another room displaying part of the Hamilton's magnificent silver collection in what used to be the castle's wine cellar. 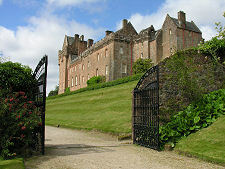 For the modern visitor there is much more to Brodick Castle than the castle itself. 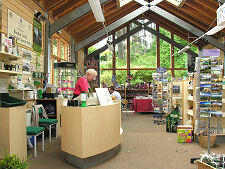 The most recent addition is an excellent visitor centre. 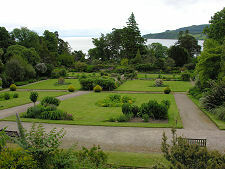 But most visitors will divide their time between the castle, the gardens, and the extensive country park that covers much of the hillside to the north of Brodick Bay. Parts of the castle gardens date back to at least 1710, according to a date in the enclosing wall. Further work was undertaken from 1814, but the main development of the gardens as they are today date back to the elevation of the castle to a stately home in 1844. 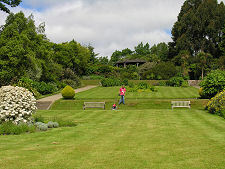 The gardens were subsequently a passion of the Hamiltons and especially of the Duchess of Montrose in the years from 1895. 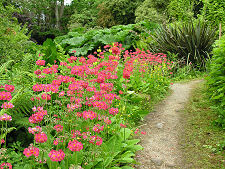 Like the Castle, its gardens offer a glimpse into another world and another time. In the surrounding country park, visitors can follow waymarked routes that extend for a half mile or a mile, or simply find their own way around. For some it is the plants themselves that will form the highlight of the tour. Others will enjoy the ice house under its heavy turf roof. A real oddity is offered by the Bavarian Summer House. This has an outer surface imitating tree roots; and the interior is largely lined with pine cones. The end result is impressive, but in a way that is more spooky than simply pleasant, bringing to mind the story of the gingerbread house, or even the more recent fable of the Blair Witch Project. Overall, Brodick Castle offers visitors a remarkably complete example of a stately home to enjoy, plus some excellent gardens and a country park. 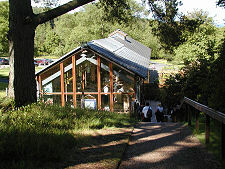 It is no surprise to find it is one of the major visitor attractions on the Isle of Arran. Isle of Arran, KA27 8HY.